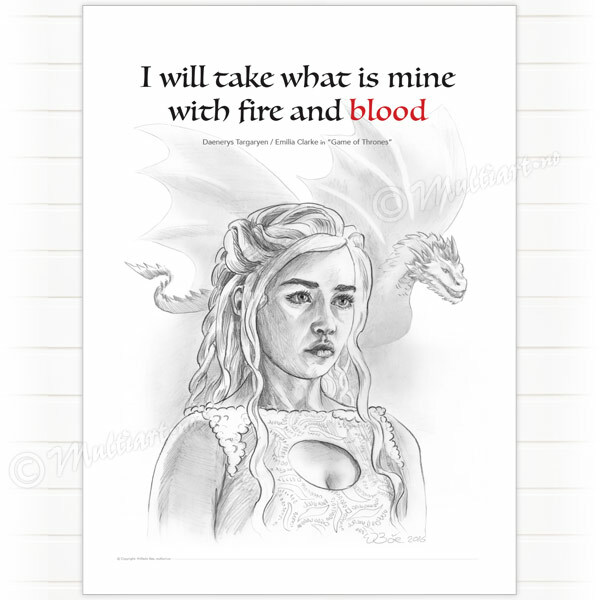 Queen Daenerys I Targaryen, also known as Dany and Daenerys Stormborn, is a major character in the American fantasy drama «Game of Thrones.» She is played by starring cast member Emilia Clarke. Daenerys receives three dragon eggs from Magister Illyrio. From the eggs, Daenerys gets the three dragons Viserion, Rhaegal and Drogon. Dragons are scaled, reptilian creatures, with two legs and two wings.They use their wings as forelegs like bats. They have sharp teeth and claws, leathery wings and long necks and tails, with spiny crests running down their backs. As hatchlings, they are around the size of a cat, but continue growing and can reach sizes large enough to swallow a mammoth whole. The polished skulls of the House Targaryen dragons look like glittering onyx, and their teeth like curved daggers of black diamond. Their bones are black due to their high iron content. Dragonbone is a highly sought after crafting material. A dragon’s scales are largely but not entirely impervious to flame; they protect the more vulnerable flesh and musculature beneath. As a dragon ages, its scales thicken and grow harder, affording even more protection, even as its flames burn hotter. Whereas the flames of a hatchling can set straw aflame, the flames of Balerion and Vhagar at their prime melted steel and stone. Probably the most famous attribute of dragons is their ability to breathe fire. Dragon flame can turn flesh to ash, melt steel, and crack stone. Older dragons can produce more intense flame for longer duration. Dragons seem to produce their fire-breath by expelling chemicals out of two tubes in the back of their throats: when these volatile substances combine, they undergo an intense reaction which bursts into a directed jet of fire.